A lot of preparations for the Spring Vintage Market at the Park have been going on around here lately. It is on April 18th and it is approaching quickly. We are going to stick with a shabby theme and use white, light pinks and light greens at this show. 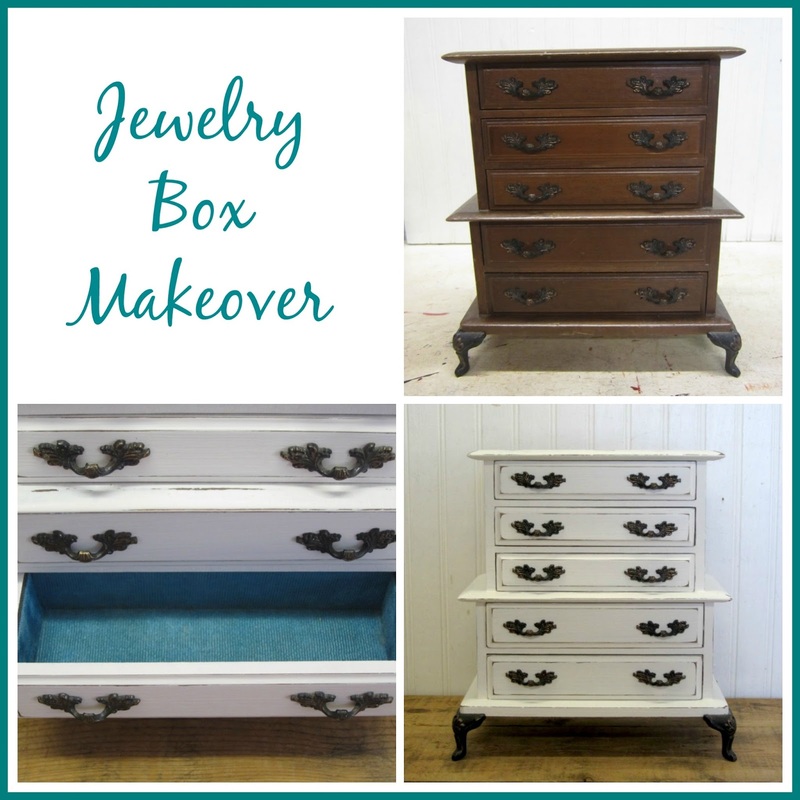 One of the projects I finished up recently was a vintage musical jewelry box makeover. If it doesn't sell before the show, it will be available at the show. 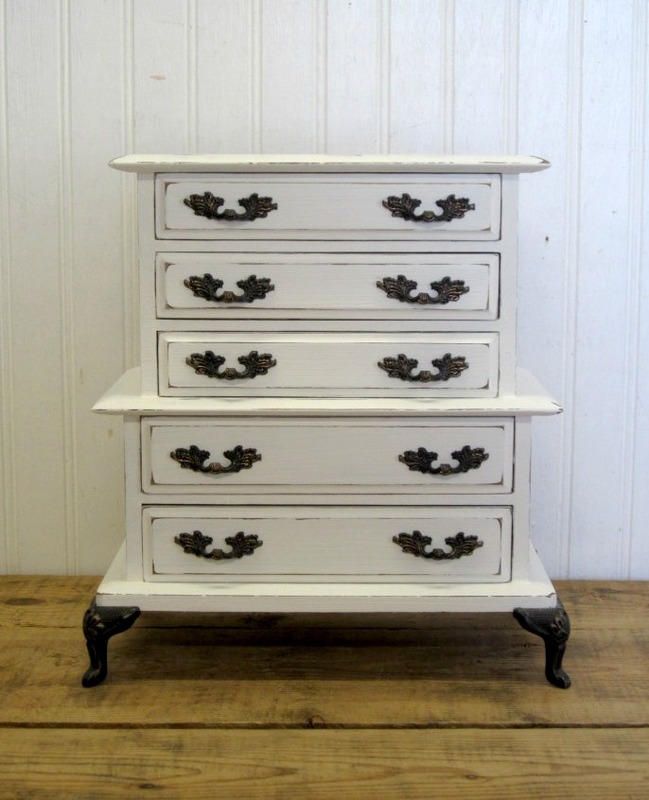 I used Amy Howard chalk paint to give this dated jewelry box a makeover. paint, allowing each coat to dry in between coats. I lightly distressed the edges once the paint was dry. Then applied a clear wax to protect the finish. Lastly, the handles and feet were put back on to finish up this makeover. The deciding factor for me to purchase this jewelry box was the lining in the drawers. It is a beautiful teal color and it is in great condition. Isn't it such a pretty color? Oh and did I mention, it has a working music box! Another piece rescued from a garage sale and given new life. you might want to look at some of my other makeovers here, here and here. What are some of the items that you love to makeover and you always buy them when you see them? I hope you were inspired by a project or two and I hope you have a blessed day. Great little piece. 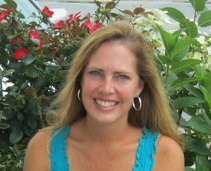 Great job on the makeover too :-) I was just on Pinterest and saw your cute little banana hanger update, so cute!! I have that same bunny that you have it that picture too. I got mine at Hobby Lobby. Hope your week is EXTRA WONDERFUL!!! Hi Sherri, Thank you! Isn't that banana hanger cute! I'd love to take credit for it, but Charlene from Organized Clutter is the brains behind that one. I pinned it in case I find a banana hanger, I'll remember it. She does great repurpose projects all of the time. If you aren't following her, you might want to. The bunny is super cute too. Thank you!!! Love how you have transformed the box - lovely!